PumpAudio V2 or Pumps as they are also called used to be in our “best bass earbuds” list. Because this is an older model and is hard to get we removed it from our guide. Below is the Pump Audio V2 review. Someone branded these earbuds as “Beats slayers” and we understand why. The main purpose for these earbuds was to create a really hard hitting bass for bassheads. They did a good job. 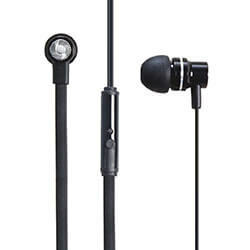 For a price of around $50 (used to be $100) you get a pair of earbuds with a lot of oomph. The silicone ear tips in the package are pretty good at staying in, but you have to readjust them from time to time. In case you want the absolute best fit possible you need a pair of memory foam ear tips. You get them in the V2 model or buy on PUMPS website. Passive sound isolation is good with the silicone tips but gets even better with foam ones. Comfort is good with the original silicone ear tips, but yet again become very good with the memory foam tips. You’ll literally forget you’re wearing them. You can easily wear them for the whole day without irritation. We really recommend getting the foam tips as they completely transform the fit and comfort experience with PumpAudio “Pumps”. Flat cable style has anti-tangle capabilities and doesn’t create microphonics when rubbing with your shirt. The rubber is thick and flexible enough to promise good durability. The casing is made out of aluminum which many more expensive earbuds even on this list can’t brag with. They are also water resistant so some rain or sweat don’t kill them. The 3.5mm gold plug-in is I shaped which isn’t ideal, but the weak points seem well protected from accidental tugging. Overall, they are well built and you can expect long durability from them. You also get a 5-year full replacement warranty in case they die out. This much trust in a product tells a lot. The in-line remote and microphone work well. You can play/pause, accept calls and change songs with it. You just need to learn the combination for each feature. In the V2 version, you also get a clamp carrying case and 3 pairs of memory foam ear tips. Pump Audio V2 in black color. How does the bass sound? Well, it’s full, detailed and deep. They have really focused on creating very strong lows and it shows. Every song you’ve listened before will sound different with these. They are bass heavy, to say the least. If you’re a purist, avoid them. If you’re a basshead, get them. The mids are a bit recessed. The highs are crisp and without sibilance. Altogether it’s a V-shaped sound signature. If you’re looking for premium basshead earbuds, choose Pump Audio. With memory foam tips, strong, punchy bass, and great durability, they have everything you need. Now all for an affordable price of around $50.